According to a “World Prison Brief” ranking published at the end of last January, Haiti occupies the dishonorable first place out of 205 countries, for the most overcrowded prisons in the world, followed in 2nd place by the Philippines and El Salvador. 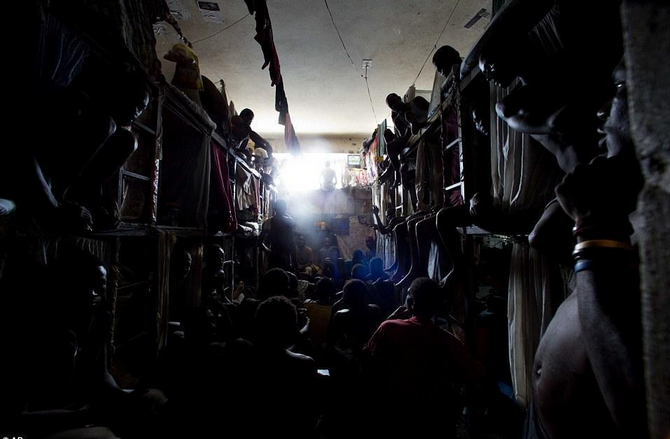 In June 2016 (study reference) the 17 Haitian prisons in the country, had an average occupancy rate of 454% (June 2016) and the space per detainee was a little less than 0.5 m2, far of the international standard which is 4.5 m2. The prison population in Haiti was about 10,500 prisoners (96 out of 100,000 inhabitants) for 2,431 places available. The result of this overcrowding causing many human violations, important health problems, spread of diseases, malnutrition and violence. 72% of the prisoners were in pre-trial detention without having been tried. The average length of pretrial detention is 1,100 days according to a Minustah study in December 2016. In the Dominican Republic, ranked 25th out of 205 countries, the average occupancy rate of the country’s 38 prisons is 190.6%, with 27.018 prisoners (247 out of 100,000 inhabitants) for 14,219 places available (November 2017). The pre-trial detention rate is 63.8%. President Moise is working to solve the problem but needs the support of his people to succeed..
Had Jovenel acted earlier he would be heroic. Acting now simply sees him reacting to International pressures.